On this page you will find links to my favourite miniature blogs and artisans. These are the ones I check out time and again for their gorgeous, dreamy images. Brew yourself a cup of tea (or coffee)…. put up your feet… and covet along with me! Click on the highlighted Links to visit their websites. Liberty Biberty. This is a fellow creative mom that makes 1:12 scale houses and minis mostly from what she has on hand. She uses textured finishes and pretty paper liberally, and I think that is what sets her beautiful pieces apart. Your eye will dart all over her scenes and find many clever things she has made from upcycled bits of this and that. Very unique…and quite precious! Turner’s Small World. Pipa Turner’s miniatures are beautifully refined and influenced by 18th and 19th century design. She and her site are German, so you must have google translate it. 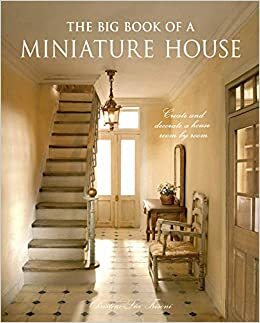 Check out the videos of her making the house featured in Lea Frisoni’s book ‘The big Book of Miniature Houses’. Cinderella Moments. This artist makes the most romantic and whimsical custom cottages! Her site is full of photos of the making of her sweet tiny abodes as well as a handful of easy to follow tutorials. She also sells downloadable plans for making some of these houses. 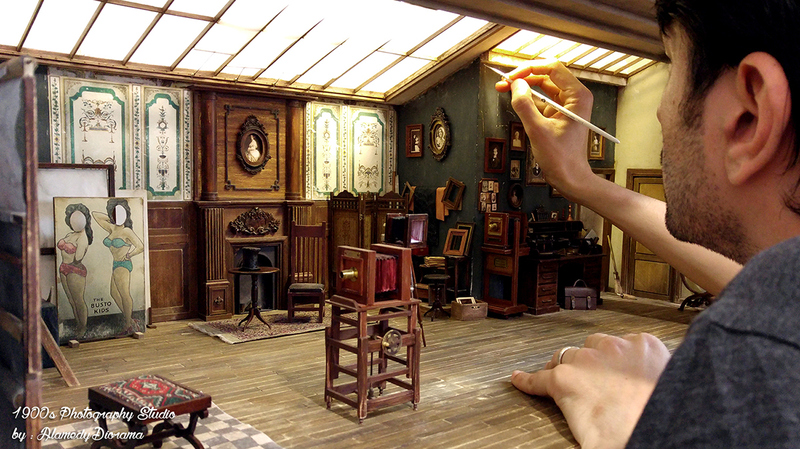 It’s a Miniature Life. Kim Saulter is one of my absolute favourites at making miniature sweets. Her style, I would say is shabby-vintage. It evokes nostalgia for Grandma’s kitchen as soon as you see her lovely cakes and confections. Kim also makes the dreamiest kitchens that make you long to shrink down and pull up a chair to her table. Her website is full of gorgeous eye candy but has not been updated for a few years. Her Instagram page is kept updated. Nu Nu’s House. If Kim Saulter is my favourite nostalgic food artist, Nu Nu’s House ranks as my favourite for just about any other miniature foods. Check out the masterful works of Tomo Tanaka on the Instagram page! Ali’s impressive photography studio roombox. Ali Alamedy. I just enjoy this gentleman’s outlook on life as well as his impressive dioramas. Ali was born in Iraq and escaped the turmoil there with his young family. If you follow him on Facebook he shares a lot of himself, his work, and offers generous insight to his techniques. Check out his Instagram page! Marcia Backstrom. 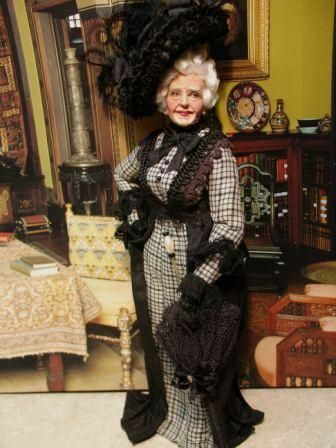 A fabulous dollmaker who is no longer with us. Her dolls are full of so much character and life! Check out this Pinterest board which showcases 100 of her creations. True2Scale. True, this is mainly a shop, but it’s also a great place to browse or spark the imagination even if you don’t buy anything (they DO have great kits there). 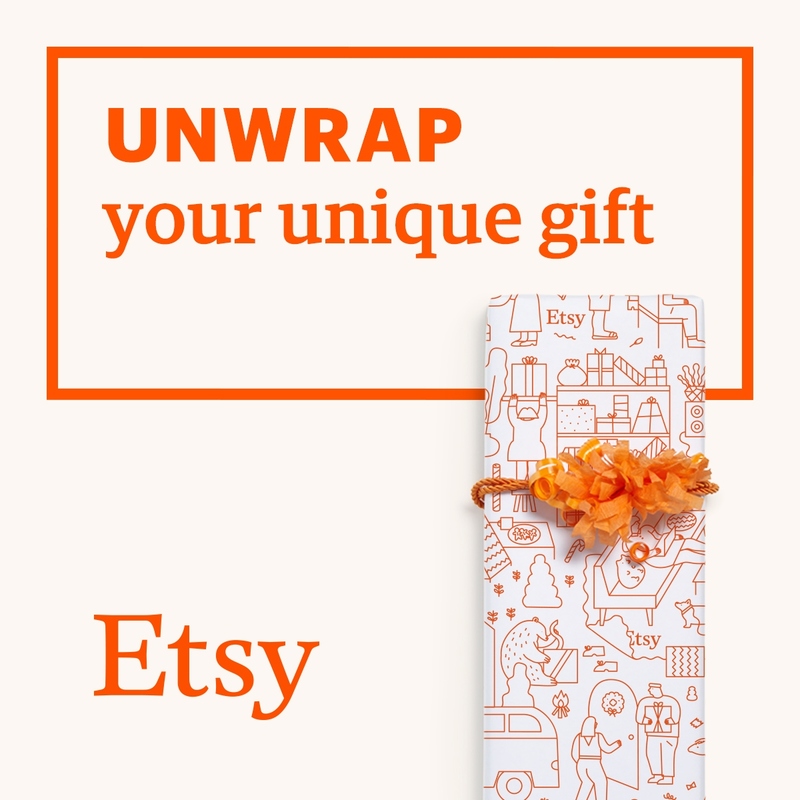 There are a few tutorials (more would be nice) and an awesome ‘Oh My’ page which showcases their customer’s gallery and more. Otterine’s Miniatures. Full of dollhouse eye candy! You must check out her ‘Haunted Heritage’ first and then look at all the other marvelous wee homes she built. I am not including a pic of her site here, because I know from reading her blog that she doesn’t like her images used. That is her prerogative, and it’s fine with me. Some bloggers don’t mind their pics shared if they link back to their site, some do. Nerea Pozo. Nerea makes beautiful room boxes/dioramas for dolls. You can really see the passion in her work. I believe the majority of her dioramas are 1:10 scale and her 1:6 is also popular. 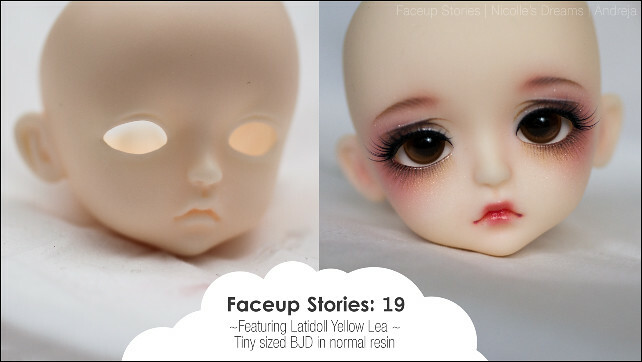 They become the abodes of lucky dolls like PukiFee, Lati Yellow, and Blythe. No detail is missed. She adds so many little extra accessories. Chosen colors and patterns have a very precious appearance. She also sells her dioramas and repainted dolls on Etsy, as well as downloadable printies for all things to feather your little nest. Nicolle’s Dreams on YouTube has had me glued to the screen for …well longer than I should say. Andreja is the face-up artist behind the videos. Her videos of repainted Monster High dolls and BJD faces are mesmerizing. If you have never watched one, you should check it out just once. You too will probably be amazed. Mouses Houses. Probably one of the most marvelous websites for miniatures I’ve come across.Such adorable mice and other critters! I wont say too much …You will just have to check out the blog and see what I love about it.